Bjorn Lomborg is author of Prioritizing the World (02014), Cool It (02007), and The Skeptical Environmentalist (02001). He is president of the Copenhagen Consensus Center. Here is link to the Copenhagen Consensus flyer, The Smartest Targets For The World, which was shared at Dr. Lomborg’s talk. Lomborg opened with a photo from Haiti, showing a young girl dressed for school wading through the muck and garbage of a slum, with pigs in the muck right behind her. Lomborg was just back from working with the government of Haiti and the Canadian Development Agency to prioritize aid projects there. 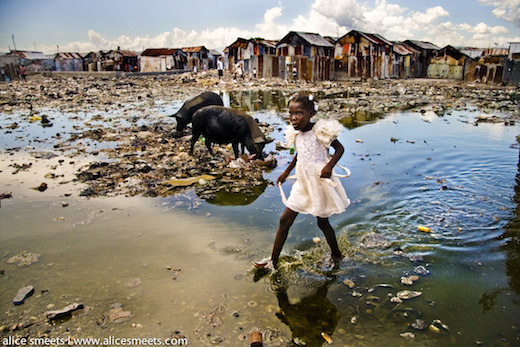 He sympathized that when people see that photo they instantly want to donate to urban sanitation in Haiti, but that is not the most effective good that can be done for the girl. There is a limited amount of aid money that can be spent in Haiti, and in the world. (Total world aid is $200 billion a year.) It helps to look at what are the greatest multiples of good you can get for each dollar spent—the benefit-cost ratio (BCR). For urban sanitation, when you do the math on the costs of building and maintaining pit latrines and compare it with the benefits (measured in dollars) of deaths and diseases avoided, of productivity and education gains, etc., for each dollar spent, you get only about 77 cents of benefit. How does that benefit-cost ratio (BCR) of less than 1 compare with other forms of aid such as, say, cleaner cook stoves? Indoor air pollution from traditional cooking kills 4.3 million people a year in the developing world. According to Lomborg and his Copenhagen Consensus colleagues, when you substitute cleaner fuel, you get a BCR of 15—each dollar spent yields $15 of benefit, with drastically fewer deaths, and a far better home to grow up in. Not all problems have such direct solutions though. Poverty is hard to fix directly, and so is corrupt government, but working in areas that do have known solutions can affect them indirectly. Better education helps everything, and the form of education that has far the highest yield is tripling preschool in Africa (BCR = 33!). But what helps education more than anything is making sure that there’s good nutrition for infants up to two years old, which gives them better brains, making them better and happier students (BCR = 45), and follow-up research shows that they have far better lives. The worst infectious disease that can be treated easily is tuberculosis, which kills 1.5 million people a year. Good treatment gives a huge BCR of 43. From 1995 to 2010, 37 million lives were saved with ever-improving TB treatment. And so it goes across the spectrum of aid. Lomborg noted that the way the $200 billion of annual aid is currently spent gives a BCR of about 7. That’s $1.4 trillion of good. But if spent for highest effectiveness, it could give a BCR of 32--- $6.4 trillion of good, an extra $5 trillion of benefit each year. Returning to the young girl in Haiti, Lomborg said that prioritizing aid intelligently would focus on helping provide her with: better nutrition; better school; better health; safer births; higher income; less violence in her society; less air pollution in her home; more energy; and more rights as a person. The photo evokes none of those things. Her life would.